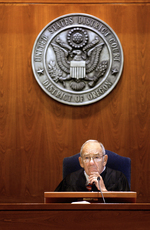 Judge James Redden, who has presided over the epic case of salmon vs. dams on the Columbia River since 2003, has asked the court to reassign the case. A news release from Save Our Wild Salmon announced the judge's decision to step down from the case yesterday. Redden's office confirmed his decision today. But no one I've talked to so far has been able to explain why the judge wants out. Maybe, as Save Our Wild Salmon Communications Director Amy Baird suggested, he's heard enough. In the last court hearing on the case, the judge cut the proceedings short unexpectedly. The implication to people who have been following the case year after year was that both sides were repeating themselves. There was nothing left to say. "I think the BiOp case may be punched out," Charles Hudson of the Columbia River Intertribal Fish Commission told me at the time. "Everything's been said. I think people are tired." The judge's request to have the case reassigned comes as the many stakeholders in the case are mulling over the federal government's newest revised plan for managing the Columbia's dams to protect salmon. There was this hint of a spat last week over adding a scientific review panel to weigh in on the new plans. In August, Redden told the feds their controversial dam management plan - also called the BiOp - still needed yet another revision. And the 20-year-old legal battle over dams and salmon marched on. The plan is OK through 2013, Redden concluded, but after that there are too many uncertainties - particularly about how much habitat restoration will help overall fish survival. The best course, Redden decided, is for the feds to follow the existing plan - with court-ordered spills of water over the dams to help fish survival in the spring and summer - until NOAA can produce a better biological opinion with mitigation actions that are "reasonably certain to occur." The lingering question was whether actions would have to include removing the Snake River dams, spilling more water or changing dam reservoirs to help fish passage.